The Revolution SVR Ping Pong Table is a fusion of luxury, style, quality and attention-to-detail. Killerspin proudly exists to connect families, friends, customers and employees through luxury table tennis equipment. Killerspin Revolution SVR is beautifully designed to look good at home, or in the office. The all-black finish of the table top and silver base gives this ping pong table a sleek, elegant look. Alubond, a composite material made of aluminum and plastic PE (polythene) core, forms a solid base for the 1” MDF table tennis top. Adjustable legs ensure the surface is perfectly level, and a convenient drawer provides space for ping pong paddles and balls. Our Revolution SVR table tennis table is suitable for friendly competition as well as fierce tournament play. The anti-glare surface finish and silkscreened lines ensure a world-class ping pong experience. The White Glove Delivery Service is available for only $450. All orders will be processed and shipped within two business days. Once your order is shipped you will receive an email with your tracking information. All orders, excluding tables, are sent via UPS, USPS or FedEx Ground, and standard delivery time is 3 to 5 business days. Shipping cost is determined by the zone where the destination zip code is located. Orders of $75 or more automatically receive free standard shipping service to locations in the contiguous United States. International FedEx shipping to Canada is charged $30 regardless of the amount, and all taxes and duties must be paid by the consignee. Second day and Overnight deliveries are also available for an additional charge. Killerspin's White Glove Service makes ping pong table delivery simple. We'll deliver your new table, bring it into your home, set it up correctly, and place it exactly where you want. Our professional installers then clean up the mess, take away all the packaging, and leave your new table ready to play. The only thing you have to do is start playing! Search for “BILT instructions” at the App Store or Google Store and download free app. Once in the BILT app, search by Killerspin table model and select instructions. Begin easy assembly of your new Killerspin table using the BILT 3D-guided interactive instructions. DOWNLOAD YOUR FREE UNPLUGNPLAY KIT! 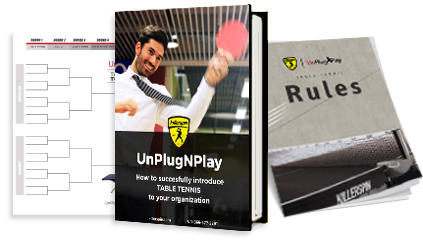 Take the first step in transforming your company's culture and download the FREE UnPlugNPlay Kit today. Download Your Free Kit Now!